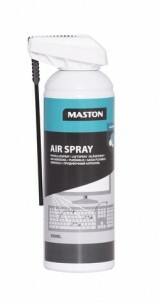 Maston Air Spray effectively blows away dust and loose dirt. Very handy for electronic and optical equipment cleaning. Pressure 8 bar (+20 °C) NB! Not suitable for camera mirrors. Instructions: Turn the power off to clean the device. Spray the surface to be cleaned. Repeat if necessary. Use the bottle in an upright position. NOTE! Flammable - Do not spray on electrical equipment when power is on.